Sometimes, a professional photographer can rank low on a wedding budget. This decision is something a couple invariably regrets. Wedding photographs are memories for generations to come. Putting a camera into the hands of a friend can turn into a disaster. With wedding photos, there are no second chances, so make the first one count. ##It’s best to pinch pennies elsewhere, such as engraved invitations, and invest in an excellent professional photographer. Wedding photography involves more than just snapping pictures. Wedding photos tell the unique story of your love. This is not the time for so-so pictures with bad lighting. You want all the emotions to come through. A father walking his daughter down the aisle is a story in itself. ##Should your budget truly demands it, hire a professional photographer for part of the day only, such as the ceremony. This will ensure that all of the important moments are captured forever. Then, you can risk having a friend photograph you dancing at the reception. ##Your wedding photographs are a treasure that will be enjoyed by your friends, children, and grandchildren. It’s what memories are made of. Our selection of wedding photographers will ensure that you end up with the exact pictures you want. Each photographer has his or her own, unique style, so take a look at our photographers’ portfolios. Will your wedding be glamorous, casual, or traditional? You want a photographer who can capture the essence of your special day. Click on those photography vendors that best capture your dream wedding and find out more about them. Don’t settle for photos. Choose a wedding photographer who can create a lifetime of memories. Couples frequently say that not hiring a wedding videographer is their greatest wedding day regret. It may seem like a luxury as you are budgeting for your venue and caterer, but ultimately, you’ll find that a photographer alone cannot take the place of a wedding videographer. You’ll be happy if you make the effort to squeeze it into your budget. ##While the venue, food and flowers are often the biggest expenses, a good chunk of your budget is going to go to lots of smaller details, such as transportation, decor, invitations, pre-wedding events, tuxedo rentals, bridal accessories and other smaller items. Losing track of these expenses is one of the main reasons couples go over budget on their weddings. Getting a wedding budget planner is one way to track and control expenses so you’ll know just where your money goes. This can help you squeeze everything possible out of your budget. 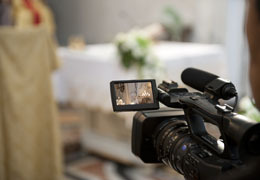 ##Have you decided whether or not to hire a wedding videographer? While photographs create memories, the actual movements and sounds of a wedding videography instantly capture the mood of a first kiss, of parents gliding on the dancefloor, or your dramatic walk down the aisle. Crucial moments can never be relived; but they can be re-experienced any time you choose to. ##Upload your wedding videos on social media and bring enjoyment to those who were present and tears to those who had to miss the wedding magic. Everyone will be able to relive the crucial moments of your special day. Take a look of our videographer selection and consider their style. Some videographers specialize in creating movie-like scenes. Others capture wedding highlights in 5-8 minutes clips. Then there are videographers who tell a story. Whatever your preference, one of our videographers will suit your style. Check out our selection and see what other brides have to say about them. If the expense of a videographer isn’t in your budget, consider hiring one for just an hour or two to capture your wedding ceremony. You won’t regret it. Wedding booths are a relatively new addition to wedding receptions, but they do add plenty of fun. A photo booth will give each guest an opportunity to get some amazing keepsake photos. Our selection of photo booths offer everyone a unique photo experience. Consider whether you prefer a closed or open-air booth, as it will affect the quality of your photos. Open-air booths provide different types of backgrounds, and everyone is in on the action. Open-air booths also offer better lighting. What a fun way for your guests to get to know each other. ##Photo booths provide wedding guests with an opportunity to interact in an enjoyable way. The bride and groom can also snap a few wild pictures of themselves for their guests. These definitely will be keepsakes. Pick an interesting background and some unique props, and fun instantaneously happens. Creating an album just for photo booth pictures can provide unlimited laughter and memories for years to come. ##Place your photo booth where it can be seen by all but isn’t in anyone’s way. Somewhere near the dance floor is a great place. It’s a nice idea to have an attendant at your wedding photo booth. He or she can encourage shy guests to relax and get into the spirit of things.